At the dawn of Wikidata, I wrote a tool called “Terminator”. Not just because I wanted to have one of my own, but as a pun on the term “term”, used in the database table name (“wb_term”) where Wikidata labels, descriptions, and aliases are stored. 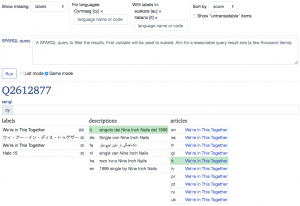 The purpose of the tool is to find important (by some definition) Wikidata items that lack a label in a specific language. 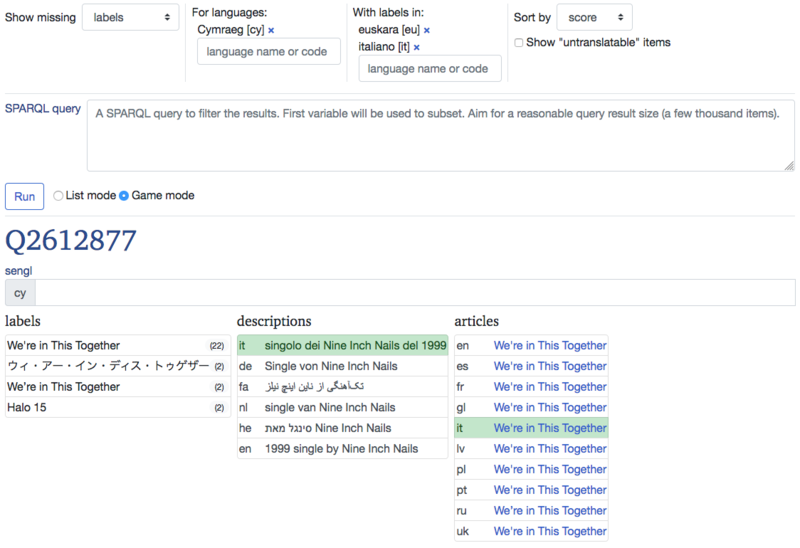 This can be very powerful, especially in languages with low Wikidata participation; setting the label for teacher (Q37226) in a language will immediately allow all Wikidata items using that item (as an occupation, perhaps) to show that label. A single edit can improve hundreds or thousands of items, and make them more accessible in that language. Well, Wikidata has grown a lot since I started that tool, and the Terminator didn’t cope well with the growth; it was limited to a handful of languages, and the daily update was compute intensive. Plus, the interface was slow and ugly. Time for a rewrite! Please let me know through the usual channels about bugs and feature requests. I have dropped some functionality from the old version, such as data download; but that version is still linked form the new main page. Enjoy! This was written by Magnus. Posted on Wednesday, July 25, 2018, at 13:48. Filed under Wikidata. Bookmark the permalink. Follow comments here with the RSS feed. Both comments and trackbacks are currently closed.